Since 2011, The French Seam has been providing Indianapolis and the Midwest area with a distinctive selection of fine fashion fabrics, quilting cottons, and sewing notions. 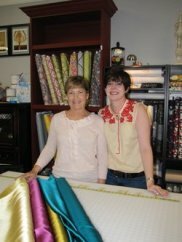 With a lot of dreaming and determination, Linda Compton and Courtney Young (a mother and daughter team) opened their Indianapolis fabric boutique to make fine fabrics affordable and accessible for the entire sewing community. The French Seam is a unique blend of vintage and modern, with a collection of patterns that provides sewing enthusiasts with an extensive variety of projects, from beginners to advanced. The shop is also a friendly and inspirational gathering place where a wide range of sewing classes helps stitchers of all ages and skill levels expand their creativity and succeed at sewing.